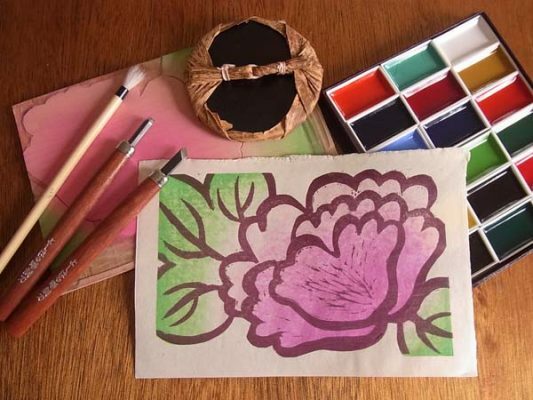 Traditional Japanese wood block print techniques will be used to create original art works. Learn how to carve your own wood block in designs inspired by patterns and symbols found in Japanese kimono fabric. No chemical solvents or presses are used in this clean, natural traditional technique. Tutor will supply: materials and use of tools on the day – these costs are included in the workshop fee. Ema Shin is a Melbourne based artist who was born and grew up in Niigata Japan. She studied traditional and contemporary Japanese printmaking at Tama Art University in Tokyo and completed a Master of Fine Art Degree at Aichi Prefectural Art University in Nagoya. She has held solo and group exhibitions in Japan, Korea, Australia and numerous other countries. Ema works with several different techniques and mediums such as Japanese woodblock printing, papier-mâché, embroidery, tapestry weaving, book making, Urauchi (chine-colle) and collage. She aims to create a composition that displays sensitivity for tactile materials, historical techniques to express femininity, sexuality and domesticity.